I’ll level with you, the last two weeks haven’t been my best. I have not gone off the rails or eaten horribly or even eaten a lot but my heart has not been in it lately. I’ve just been maintaining. I was working hard and not seeing the results that I had hoped for. Two weeks ago, I only lost a pound and for some reason that shut me down mentally. I guess it has taken me two weeks to get my head straight again. Muhammad Ali once said “Don’t quit. Suffer now and live the rest of your life as a champion”. I’ve only been going through the motions lately. There was a time when doing what I’m doing now resulted in big weight loss but not anymore. I need to find my ambition and step up my game. I need to recommit and rededicate myself every morning. I’m ready to take this to the next level now. I will keep my eye on the prize. For years I’ve thought about using acupuncture or some other healing art to assist me in losing weight. Now after losing nearly 70 pounds, I finally feel more ready to begin exploring forces outside of my own control. Don’t get me wrong, I’m still not a fan of going to a doctor’s office but I realize that this battle with weight often feels bigger than me and getting a bit of help might not be the worst thing to do at this point. Because I’m a bit neurotic, the search for an acupuncturist becomes a complicated process. Sure there are tons of qualified people out there, but I wanted someone who had extensive experience. I wanted someone who is preferably Chinese. I wanted the Chinese medicines, herbs and teas. I wanted someone with a broken English accent. I know this is faulty thinking. Maybe I’ve watched the Karate Kid too many times but my criteria made the choice seem like a more authentic one for me. Upon the recommendation of a colleague, I found and called a practitioner who was able to see me that same day. I had called several other practitioners before this but was not getting any warm fuzzies. The fact that this gentleman could see me the same day made it more difficult for me to be able to allow my nerves to get the best of me and back out. For me, going to a “doctor’s office” is an anxiety producing event. When I walked toward the door of the office I read a posted sign with several rules. I was to take off my shoes and turn off my cell phone. The act of becoming untethered to my cell phone for any length of time is also quite anxiety producing. It’s the era that we live in. I always need to feel connected. The reality though is that smart phones leave us unconnected from each other a great deal of the time. Before I knew it, I had been ushered into the space where I would receive the treatment. I spoke with the practitioner about some chronic but generally dull pain I had been experiencing for years in my left ankle as well as a new pain that had been developing over the last few months in my right shoulder. We also spoke about my weight loss journey so far and how he might be able to assist me in moving forward. Before I knew it, it was time to disrobe and get on the table. This is also anxiety producing. At over 300lbs, this body is not ready for prime time yet. The practitioner began working on my right foot as a way to ease my shoulder pain. I offered that the pain was likely the result of the way I sleep as I tend to sleep on my shoulder with my arm curled under my pillow and wedged up against the headboard. He remained quiet and I felt that maybe he was not accepting my hypothesis. I have since come to learn that in some Asian healing arts practices, shoulder pain is most often an indicator of a major stress build up. With needles inserted and electrical stimulus pulse applied, the practitioner turned off the lights and left the room for a period of time. I was left alone with the sounds of the ocean mixed with a separate recording of American Indian flute. I wondered if my American Indian tattoos had inspired him to play this for me or if it was just by chance. Either way the sounds and the needles seemed to lull me off to an extremely relaxed state in no time which is really impressive given how anxious I had been feeling. I was not tired or sleepy but my mind did produce some interesting peaceful images. It reminded me of a very lucid dream. Every once in awhile I would come back to reality when my right hand unexplainably moved on it’s own, most likely the result of being a human pin cushion. Before I knew it, the practitioner had returned and it was time to work on my ankle. I advised that my podiatrist had told me that because of the repeated sprains and strains to my ankle since the age of 18, a very large bone spur had developed and my entire ankle would need to be scoped so that the tendons could finally snap back into place and heal. I advised that I had also been told that my ankle had aged to about that of a 65 year old despite my only being 35 at the time. My practitioner laughed at this assertion and seemed to indicate with his facial expressions (although he said nothing) that surgery would probably not be necessary. Maybe that was wishful thinking on my part. I’m not completely sure. The practitioner pushed on the exact spot on my ankle that often gives me pain. When strong pressure is applied it really hurts and I had all I could do to not sit upright and scream. Then he inserted one needle on the top of my foot near my toes and said “pain gone now” and pressed again. And it was! For the first time in 19 years my ankle was completely pain free. It felt absolutely normal. Tears began to well up. I couldn’t believe the instant difference. The practitioner then began to add needles in a large circle around my stomach. I felt the tapping on the tops of the needles but never any actual pain (it’s very different than getting a needle at the doctor’s office). He also put needles in my arms and legs. One needle in my right leg definitely gave me an unpleasant sensation and sent a wave of something not nice down my leg for just a second and again briefly when it was finally removed later. I also received very tiny needles in my right ear. some of these were painful but not for too long. They were covered with medical tape and I was told that I would keep them in until my next visit. These too would help with stress relief, pain relief, metabolism boosting and food craving control when massaged at least five times a day for 30 seconds each. Again the lights went out and my relaxed state returned. At the conclusion of my visit I was told that acupuncture is not a panacea for weight loss. It will only assist in it. The hard work still belongs to me if I want to see results. I was then given a “diet” plan for a three day caloric restriction type fast (essentially eating 1/3 of what I typically eat). This begins today. It will be difficult because I’m already eating considerably less than I had been before going plant based. After the three days, I would return to a diet not unlike what I have been doing already. No dairy, no grease, no excessive oils, low carbs and no processed foods. I also was given Chinese root tea and other herbal supplements to help with metabolism and fat absorption. It was a very interesting experience and I’ll be going back twice this coming week. My only hope is that my insurance will get onboard and start picking up most of the tab as it is not at all cheap. I do fear that the treatments will become too cost prohibitive and I will need to stop before I’ve received enough of them to truly make an impact. For now though I am feeling good. The shoulder and ankle were a bit sore a few hours after the session and the pain comes and goes still. Unless I become overly tired it generally remains duller and shorter in duration than it had. I expect that these issues will need more time to resolve. I’m skeptical about acupuncture’s ability to fix my ankle pain in a lasting way. This isn’t western mind. I’m definitely willing to give it a try though. I certainly cannot argue with the pain free moments in the office. That experience still amazes me. The ear needles are neat. For some reason they make the whole right side of my face feel like it’s open (as if a piece of my skull is missing). It’s hard to find the words to explain it any other way. It’s a neat sensation. And yes my cravings have generally been in check although I’ve had my moments. We’ll see how it goes. One of the needles hurts when i massage it. The thought of having needles just stuck in my ear for days is not particularly comforting but its not stopping me from giving it a shot either. This is an exciting new phase in my adventure. I’m interested to see where this road will lead. I definitely believe that western medicine can be beneficial but if we limit ourselves only to that, I think we miss an awful lot. So this plant based diet thing is no cake walk. I was hoping that when I began this journey my preoccupation with food would lessen, but in reality, I’ve never thought of food more than I have in the last 5 weeks. In order to be really successful with this life style change, you have to plan your meals out well in advance. You have to shop for all the ingredients you need and you have to keep a fresh stock of fruits and veggies on-hand. This means going to the store about 3 times a week instead on once a week as I had been doing. The meal prep takes a lot of time. After a long day of work I find myself not always wanting to go through with the effort that it takes. So the idea of getting away and having someone else make me a dinner was very appealing. But honestly, finding a local vegan-friendly restaurant is no easy task. It took a lot of research and there weren’t many choices. We finally settled on a decent looking place not too far away. When we arrived, I asked for the special vegan menu. It was handed to my wife. That made me laugh. Clearly the waiter thought that a guy my size could not possibly be going for the vegan fare. And honestly, I really didn’t want to be looking through the vegan selections. To see the non-vegan menu and all the good stuff that I would be missing was really tough for me. Fish and clam chowder, caesar salad made with anchovies, grilled scallops. My mouth is watering now just thinking about the dinner that I didn’t get to have tonight. I was disappointed when the waitress told me that the chef was out of tofu for the “tofurrito” appetizer. The idea was to load up on the appetizers because I was certain that the entree was going to be small. 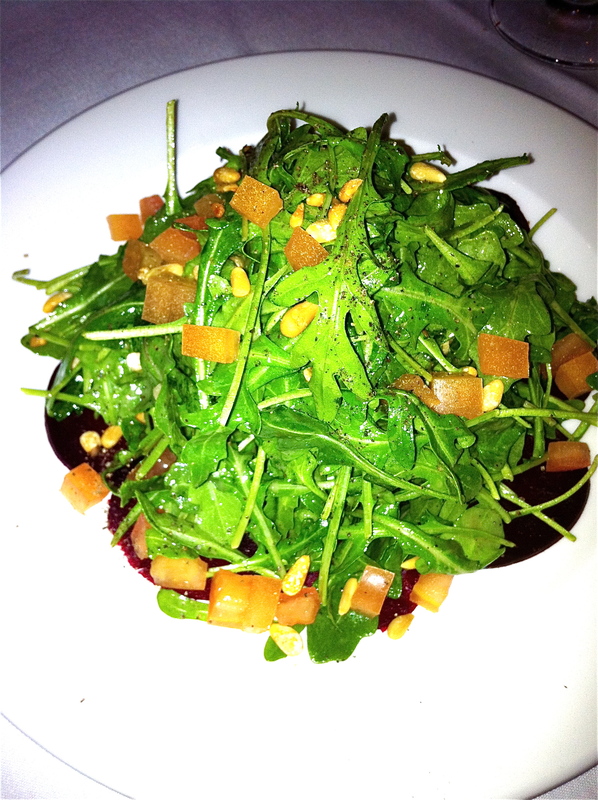 I settled for an arugula salad with diced tomatoes and pine nuts, on a bed of beets and covered with a herb vinaigrette. It was a generous mound of greens and it was quite good. I quickly made peace with not having the caesar. 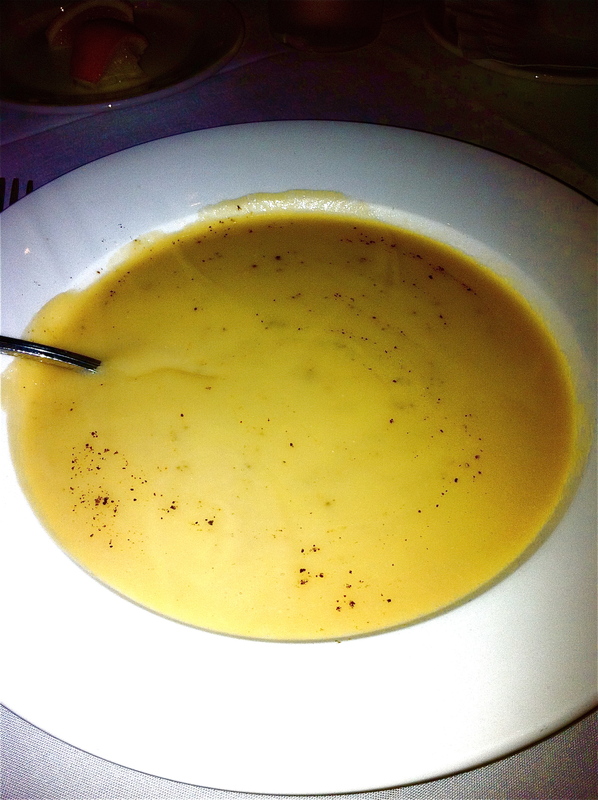 I then had a white bean soup with nutmeg and black pepper. Again it was large and it was surprisingly flavorful. Still though it would have been great to try that chowder. 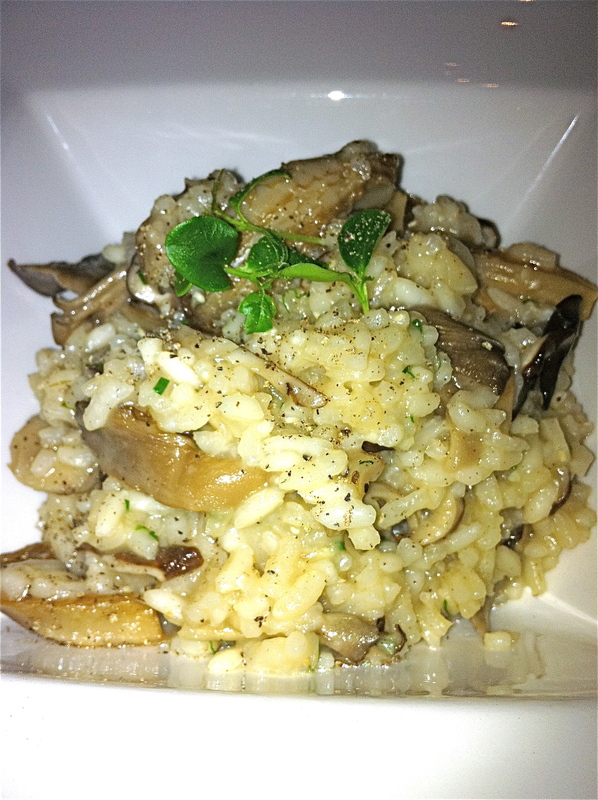 The main course was a wild mushroom risotto. It was moist and very flavorful but it was small. This is exactly what I was afraid of – small portions for non-meat eaters. I would have been okay with it if they added some asparagus or broccoli on the side but that wasn’t the case. So I chewed each spoonful about a hundred times and drank three glasses of water and by the end of the meal I was actually fairly full (for a little while at least). My portion of the bill was cheap. The total was less than nearly all of the other entree prices. Not bad. And it was definitely a very nice break from making my own dinner. Watching other people eat what you want to be eating is going to take some getting used to though.